Son of Herod the Great and Mariamne the Hasmonean; born about 35 B.C. ; died 7 B.C. Both he and his elder brother Alexander, by reason of their Hasmonean origin, were educated by Herod as successors to his throne; and for that purpose were sent to Rome (23 B.C.). Upon their return to Jerusalem (18 B.C.) they became an eyesore to the anti-Hasmonean faction at court. Herod's sister Salome, and brother Pheroras, who had been instrumental in the execution of Mariamne, were particularly apprehensive lest the two princes should succeed their father, as they would undoubtedly take vengeance upon the murderers of their mother. To prevent this, attempts were made at estranging the princes from their father by means of calumnies. Herod tried to discredit the evil rumors; and, to fasten the ties of affection, he procured distinguished alliances for both sons, Aristobulus being married to Berenice, the daughter of Salome. This, however, failed to put an end to Salome's intrigues; and Herod, at last, was induced to recall to court Antipater, his repudiated son by Doris. Seizing his opportunity, Antipater straightway began, by means of hypocrisy, slander, and flattery, to supplant Aristobulus and Alexander in the esteem of their father, and ere long became the likeliest successor to the throne. Being sent to Rome, in order to gain the favor of Augustus, he continued thence to calumniate his brothers; so persistently that Herod at last resolved to arraign them before the emperor. Meeting Augustus at Aquileia, the capital of the province of Venetia (12 B.C. ), he charged his sons with contemplated parricide. Augustus, convinced of their innocence, effected a reconciliation. Owing, however, to the ceaseless intrigues of Antipater, Salome, and Pheroras, and the strange relation of Glaphyra and Berenice, the position of the two brothers became more and more precarious. Finally, a number of the princes' followers were tortured into a public admission of the existence of a plot against the king's life. 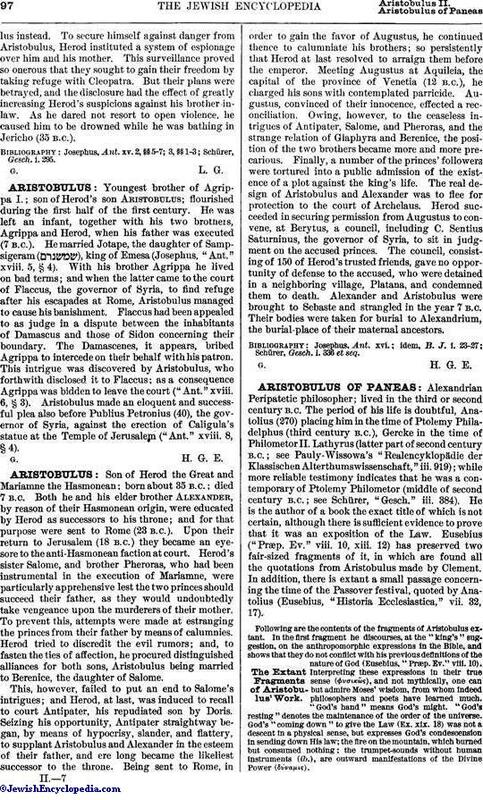 The real design of Aristobulus and Alexander was to flee for protection to the court of Archelaus. Herod succeeded in securing permission from Augustus to convene, at Berytus, a council, including C. Sentius Saturninus, the governor of Syria, to sit in judgment on the accused princes. The council, consisting of 150 of Herod's trusted friends, gave no opportunity of defense to the accused, who were detained in a neighboring village, Platana, and condemned them to death. Alexander and Aristobulus were brought to Sebaste and strangled in the year 7 B.C. Their bodies were taken for burial to Alexandrium, the burial-place of their maternal ancestors. Schürer, Gesch. i. 336 et seq.